From the super-clean, full spectrum, medicinal grade CBD extract to the recyclable packaging, Cordial Organics is the holistic solution to your skincare woes. We met with founders Desi and Shelly to talk CBD skincare and more. 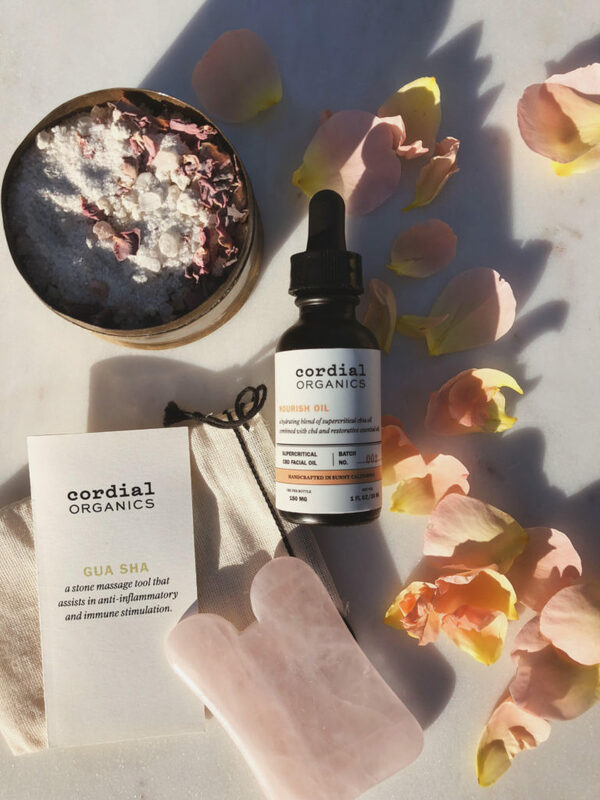 ‘Affordable’ probably isn’t the word that comes to mind when you hear handcrafted, organic, CBD-infused beauty, but Cordial Organics is ready to change that perception. Founders Desi and Shelly – nurturers, pet-owners and CBD evangelists in their home of San Diego, wanted to create a brand that is as accessible for everyone as it is truly healing for the skin. Nearing in on their third year in business, they’re proving there is a way. KF: How did you two meet? Did you know you wanted to go into business together from the get-go? Shelly: Seven years ago, Desi had a great blog that I followed weekly. The blog is an old BlogSpot that is now Modernist.us and is a lifestyle blog. Desi was always posting recipes, life hacks and interesting projects she was doing. I too always have my hands in something so I was inspired by Desi from the start. I sort became her stalker and wrote to her. I said, I think we should meet and be friends. She agreed. KF: So how did you move from internet friends to IRL friends? Desi: I had said something like, ‘someday I’m going to own this print, the pink Warhol with the cow, I love it.’ So then one day Shelly was like I have something for you – can we meet? So we met at this park, I met up with her and she gave me a magnet of that print. Around then she was moving to Australia and we met just before she moved. Shelly: I’m married to a vagabond. My husband’s a programmer, so he can work from anywhere, so we went kind of just because we could. Then we moved to Costa Rica and were there for 2 years, so I was gone for almost 3 years. I came out to visit a couple times, Desi would pick me up and we’d hang out. Desi: We stayed in touch online, we’d Skype a bit. KF: How did you eventually decide to go into business together? What was the initial spark of the idea? Desi: Shelly was homeschooling her youngest and we would walk around the neighborhood often, and she was talking about going to school to become an acupuncturist, and it was, either we were going to start a business, or she was going to go back to school to study acupuncture – I was like let’s start a business. Shelly: I decided it made more sense than going back to school. Desi was like, let’s start a business – sounds cool! Desi: We both had started multiple business, but Cordial is our first thing in this area. I ran my own internet-based company, I actually just closed it up – I’d been doing that for 20 years, and then I owned a storefront, then I made jewelry and sold jewelry, so, I mean, from my first business in the fifth grade – I made those pom-poms, with the googly eyes, you know? I put them in a pastry box and sold them on a picnic bench in the playground at school. I got shut down in like, 3 weeks. So, we’re both entrepreneurial. KF: How long ago was that, that you made that decision? Desi: Two and half years ago. KF: The rest is history! Desi: We started doing THC – so we were selling to dispensaries, but neither of us take a lot of THC. Then we kept experimenting with topicals and CBD, and Shelly was growing CBD plants – so we’ve done it all, at every stage of development. Shelly: The experience of growing the plants was great for research and development. We’ve outsourced that to farmers in Colorado now. Desi: Yeah, it was great to be acquainted with every step of the process. I feel like, then we knew what quality to source with people, we knew what wasn’t supposed to happen. We also extracted with C02, and alcohol extraction. KF: What sparked your passion for CBD? How did its superpower become evident to you? Shelly: Both Desi and I have always been attracted to wellness, plant therapy, and natural remedies. When we started to read about CBD and its benefits, we became very interested. We started growing CBD-dominant plants. These plants would become the beginning of our research and development for the recipes that now comprise the Cordial Organics menu. We worked for a year-plus growing, extracting, developing and testing recipes. As the process unfolded, we fell in love with our own products and the healing benefits of CBD and so did our friends and family. Desi: It really came with growing strains, taking to different growers, and we were making tinctures. My dog Zeke was actually the first one to try CBD. I bought CBD dog biscuits at my local dog groomer and I gave them to him for separation anxiety. Once Shelly grew the plants and we extracted CBD we used it topically – that was the big aha moment. We were super skeptical about the hype around it. Even when we formulated it, we were testing, like, what if this just has arnica in it – will that have the same result as arnica with the CBD? We were having such great results. This is what this whole journey is about. 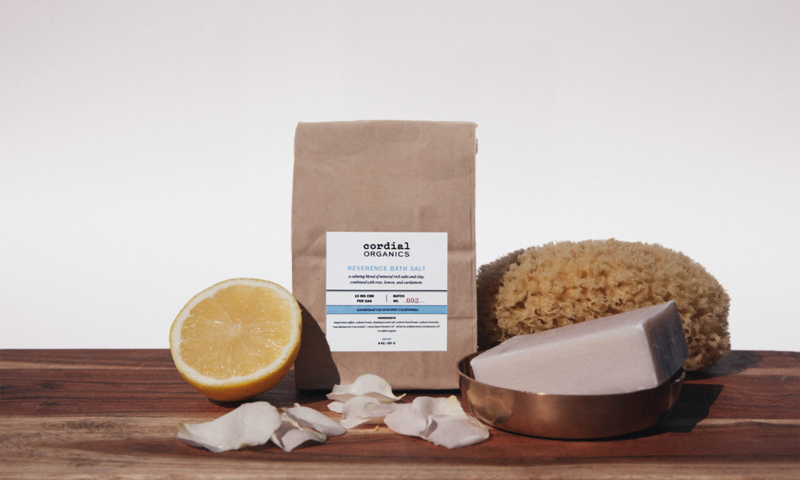 Shelly: The feedback we received from family and friends was amazing – moms put it on bug bites and scratches – we kept getting amazing feedback, so we thought – let’s develop a line. Desi: It was always our intention, even when using THC, that you would be able to buy it at the health food store – the whole design was around this being an everyday product, not involved in stoner culture, so not something with a pot leaf on it, just a part of your everyday life. That’s why our price point is lower – we’re running on a much lower margin than others. I want a college student to be able to buy it, both Shelly and I don’t want people to have to think about it as a special-time use thing, but rather it’s a tool in their tool kit and it’s not 80 bucks. I don’t care how much money you have, if you have something that expensive, you’re not going to use it casually everyday. I don’t want you to have to keep it a special thing, I want it to be an everyday thing. KF: What’s your ultimate mission with Cordial Organics? How do you want your clients to feel when they invite you into their cabinets / makeup bags / lives? Shelly: We hope that Cordial Organics makes a difference in people’s lives, for the better. In addition, pain relief – we’ve heard from a few customers who have cancer and are in chemotherapy and they say our products offer them pain relief, which is amazing to hear. 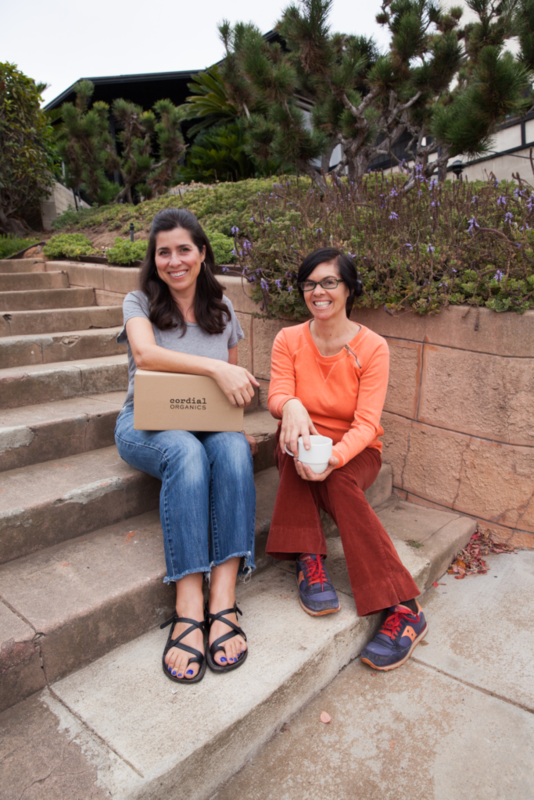 Desi: Ultimately, Shelly and I would like people to feel empowered. Empowered to make choices that are gentle, but have a huge impact on their overall well-being. We had a client that has tried every type of treatment for her migraines and never thought that anything ‘natural’ would ever touch the pain that she lives with, write to tell us that Restore Stick is working for her. That’s the type of thing that makes you able to better advocate for your health. We hope that Cordial Organics can do that for all kinds of people. KF: From supporting local farmers to using recyclable packaging to donating a portion of your profits to causes you believe in, your brand is obviously about more than simply ‘green beauty.’ Why is it important to you both to pay attention to details like these? Shelly: These details are important because it makes sense to live and act from a place rooted in kindness and with the well-being of others in mind. Desi: It’s just how we live our lives. It’s not any different than how our homes are run. We definitely thought about that stuff. It’s hard to make those choices too, it could be plastic – less expensive to ship, the lighter weight may help use less gas, but… do we want plastic on our skin or next to things on our skin? It’s a balancing act – all those things were thought about and where we could avoid it, we did. KF: What’s a current favourite Cordial Organics product for each of you? Shelly: We love all our products and use them daily! There isn’t a product of ours that we don’t use. Desi’s dog Zeke and my cat Doomy even use the Calm for Pets! We never leave home without Soothe lip balm, Restore stick and shimmer in our bag. If one of our kids fall, they’re like “I need some Restore!” so the whole family uses it. Desi: I use Restore to massage my husband’s neck to keep his migraines from being an issue. To change it up in the evening I use the bitters, I try to break up – I’ve been using CBD to help balance my hormones, its better if I take the dose I’m taking and throughout the day to keep it at a consistent level, so sparkling water with bitters in the evening. KF: Anything else you want to share? Desi: I’d love the product to come to Canada after legalization – we get so many requests, we’d love to be able to meet that need.